Matrimonialsindia.com is a matchmaking site located in New Delhi, India with personals of men and women interested in marriage. There are more females who visit the site than men. About 1 percent of those visitors are from the United States and even less from Australia as well as other countries. Much of the site's audience has attended graduate school and some college, according to the latest public statistical data. The website uploads much slower than most sites; however it is user friendly. Registration is free and customer support is available. The website claims to have one of the largest databases of singles coupled. 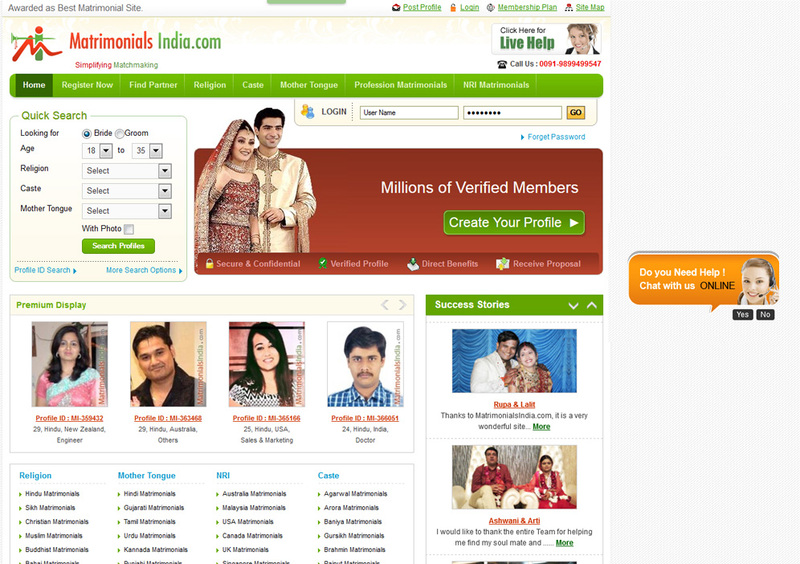 On the front page of the website, you are able to quickly search the dating pool. You will start by selecting a bride or groom, age range, religion, caste, mother tongue, and check box profiles with photos. There are additional search criteria you can fill in as well such as profession preference and there is Smart Search which provides matches to your profile once you have logged in and completed it. You have the option of selecting three different matches: Perfect eMatches, Members I am Looking for and Members Look for Me once you join the site. You will not be able to view most photos until you complete the free registration form. But you are able to check out some members advertised in the premium display, just not their profiles. Information needed to sign up includes: email, create a password, profile created for, holder name, country, mobile and landline phone. You will also include once again your criteria in the search opposite the registration form which is a tad bit annoying since that will have already been completed in the quick search. Agree to Terms and Conditions and you are ready to start browsing photos. Do read the agreement. For instance, minors are not permitted to use the site, a profile cannot be transferred to someone else, Matrimonials also doesn't want their website images and other information used elsewhere, and the site can take your photo from any of your social networking profiles or chat ids. Also read about payment and refund details as well. Another issue was that you couldn't proceed to do anything more with the site until you filled out the registration form then you will Post Profile so that members can find you. Creating the profile and uploading a photo is free. Live help is available to walk you through the site. There are free and paid members. Members have an option to choose from five plans and they are 3, 6, or 12 month memberships. You will need to join the site to find out recent costs. Paid members are given priority in search, allow access to contact information, can create and send messages, receive and respond to messages, and utilize other features. Free members can only send "Express Interest," but not messages. Members have a choice of approving or declining interest. There is a section on the site that helps with keeping track of your connections. There is also a "My Favorites" where you can add those profiles that you really like. 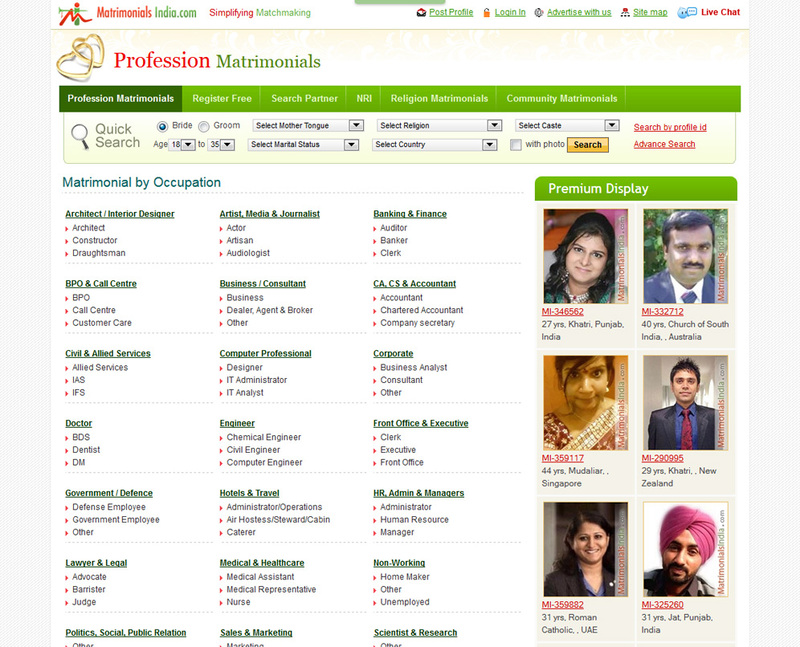 Matrimonials will also send you matches based on the criteria you have selected. If you browse for awhile, someone will ask you if you need any help. Members are able to "Send Interest" to one another. Around the web, Matriominals users did rate the chances of getting a partner on the site quite high, liked the features and member photos, found it easy to use, customer support helpful, but there were complaints to date about the cost to use the matchmaking service. One user called them frauds because they frequently call about paying for service. Another was unhappy with search function. A disappointed user was angered that he didn't get the right matches. Other reviews included fake profiles and the site not being helpful and a "waste of money." As with any matchmaking site, do be cautious. 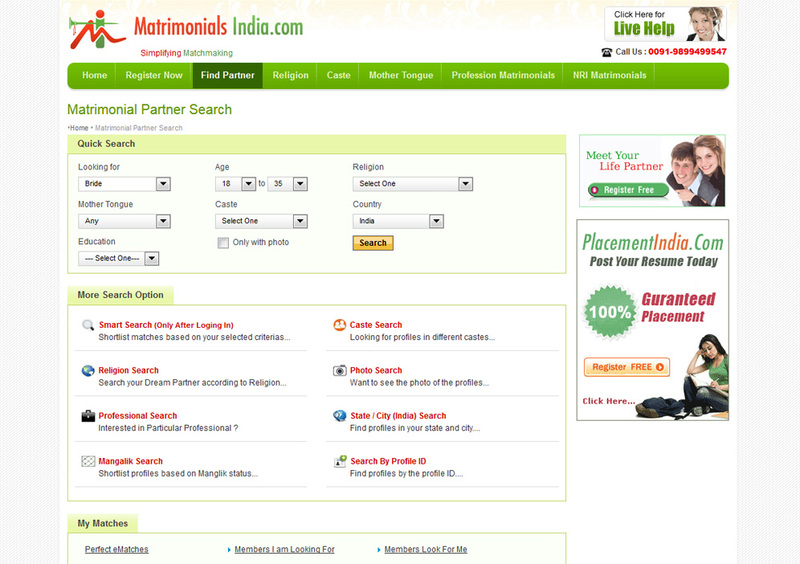 Start with a free membership, but think twice about giving Matrimonialsindia.com your main phone number.